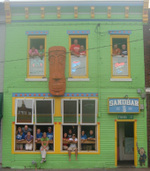 Sandbar Resolutions - The Sandbar...Home of the Indoor Hurricane! Happy 2011! We're excited about the new year and all the things we want to do. Here's just a few things on our radar. We'll call them resolutions, but they're really just some things on our list that we want to accomplish. The hurricane has been running since 2002, can you believe it? And it's time to upgrade our setup. In fact, we have to- we have a new video to add, but our current system can't quite handle it. Of course, Dave also wants to add more- more wind, more lightning, more everything. We have one new video to add, but it's really not totally new. It's recycled footage from some older videos, which means it will be new to most of you. You might remember last August when we had a hurricane video contest. Our winner, Kim, has been patiently waiting for months for her video clip to debut, and we want to make her a star as soon as possible. Don't worry, we'll get a brand new video done soon. You all know we try to outdo ourselves every year on St. Patrick's Day. This year will be no exception. It will be hard to top last year's castle, but not impossible. We have a beach upstairs, but it doesn't get much use. We don't have many options; the upstairs space doesn't increase our capacity and we're still limited to 49 people according to fire code. But surely there's something we can do up there that would be fun. Suggestions welcome! There's a few of our goals for 2011. I'm sure we'll have many, many more. What goals or resolutions do you have for the new year? We'd love to hear them! Leave us a comment, and in a few days we'll put together a list for the blog.